T600 is an exceptional thermal desktop printer for applications that require reliability, versatility and ease-of-use. 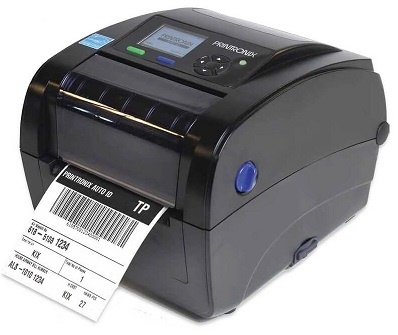 Printronix T600 4.0inch wide Desktop Thermal Transfer Printer is remarkably well suited to a large variety of industries due to its ability to utilize both Direct Thermal and Thermal Transfer technology. Versatile Features : Option to choose between direct thermal and thermal transfer printing, Multiple connectivity choices including Serial, Ethernet, USB, USB Host, Compact size fits anywhere. Cutter - Cutter can be ordered factory installed or the option can be installed by an authorized service representative at a later date. Once installed, the printer can be configured to automatically cut media after each or a specified number of labels is printed. Peel & Present - Peel & Present may be ordered factory installed, or the option can be installed by an authorized service representative at a later date. Once installed, the printer can be configured to automatically peel and present each label. Direct Thermal Labels for Desktop Printers, Size: 101mm x 52mm - Direct Thermal (DT) Die-Cut Standard Labels for Desktop Printers, Size: 101mm (width) x 52mm (height), White Uncoated Paper, Permanent Adhesive, Outside Wound on 1.0" (25mm) core, Maximum Outside Diameter 5.0" (127mm), Perforated, 1400 per Roll, 12 Rolls per Box. Total Labels per box 16800. Price per Box. Direct Thermal Labels for Desktop Printers, Size: 101mm x 52mm - Direct Thermal (DT) Die-Cut Standard Labels for Desktop Printers, Size: 101mm (width) x 52mm (height), White Uncoated Paper, Permanent Adhesive, Outside Wound on 1.0" (25mm) core, Maximum Outside Diameter 4.0" (101mm), Perforated, 720 per Roll, 12 Rolls per Box. Total Labels per box 8640. Price per Box. Direct Thermal Labels for Desktop Printers, Size: 38mm x 25mm - Direct Thermal (DT) Die-Cut Standard Labels for Desktop Printers, Size: 38mm (width) x 25mm (height), White Uncoated Paper, Permanent Adhesive, Outside Wound on 1.0" (25mm) core, Maximum Outside Diameter 4.0" (101mm), 1380 per Roll, 12 Rolls per Box. Price per Box. Total Labels per box 16560. Price per Box. Direct Thermal Labels for Desktop Printers, Size: 38mm x 25mm - Direct Thermal (DT) Die-Cut Standard Labels for Desktop Printers, Size: 38mm (width) x 25mm (height), White Uncoated Paper, Permanent Adhesive, Outside Wound on 1.0" (25mm) core, Maximum Outside Diameter 5.0" (127mm), 2670 per Roll, 12 Rolls per Box. Price per Box. Total Labels per box 32040. Price per Box. Direct Thermal Labels for Desktop Printers, Size: 40mm x 40mm - Direct Thermal (DT) Die-Cut Standard Labels for Desktop Printers, Size: 40mm (width) x 40mm (height), White Uncoated Paper, Permanent Adhesive, Outside Wound on 1.0" (25mm) core, Maximum Outside Diameter 4.0" (101mm), 900 per Roll, 12 Rolls per Box. Price per Box. Total Labels per box 10800. Price per Box. Direct Thermal Labels for Desktop Printers, Size: 57mm x 32mm - Direct Thermal (DT) Die-Cut Standard Labels for Desktop Printers, Size: 57mm (width) x 32mm (height), White Uncoated Paper, Permanent Adhesive, Outside Wound on 1.0" (25mm) core, Maximum Outside Diameter 5.0" (127mm), 2235 per Roll, 12 Rolls per Box. Total Labels per box 26820. Price per Box. Direct Thermal Labels for Desktop Printers, Size: 57mm x 32mm - Direct Thermal (DT) Die-Cut Standard Labels for Desktop Printers, Size: 57mm (width) x 32mm (height), White Uncoated Paper, Permanent Adhesive, Outside Wound on 1.0" (25mm) core, Maximum Outside Diameter 4.0" (101mm), 1135 per Roll, 12 Rolls per Box. Total Labels per box 13620. Price per Box. Direct Thermal Labels for Desktop Printers, Size: 60mm x 38mm - Direct Thermal (DT) Die-Cut Standard Labels for Desktop Printers, Size: 60mm (width) x 38mm (height), White Uncoated Paper, Permanent Adhesive, Outside Wound on 1.0" (25mm) core, Maximum Outside Diameter 5.0" (127mm), 1830 per Roll, 12 Rolls per Box. Total Labels per box 21960. Price per Box. Direct Thermal Labels for Desktop Printers, Size: 50mm x 25mm - Direct Thermal (DT) Die-Cut Standard Labels for Desktop Printers, Size: 50mm (width) x 25mm (height), White Uncoated Paper, Permanent Adhesive, Outside Wound on 1.0" (25mm) core, Maximum Outside Diameter 5.0" (127mm), Perforated, 2670 per Roll, 12 Rolls per Box. Total Labels per box 32040. Price per Box. Direct Thermal Labels for Desktop Printers, Size: 50mm x 25mm - Direct Thermal (DT) Die-Cut Standard Labels for Desktop Printers, Size: 50mm (width) x 25mm (height), White Uncoated Paper, Permanent Adhesive, Outside Wound on 1.0" (25mm) core, Maximum Outside Diameter 4.0" (101mm), Perforated, 1380 per Roll, 12 Rolls per Box. Total Labels per box 16560. Price per Box. Direct Thermal Labels for Desktop Printers, Size: 60mm x 38mm - Direct Thermal (DT) Die-Cut Standard Labels for Desktop Printers, Size: 60mm (width) x 38mm (height), White Uncoated Paper, Permanent Adhesive, Outside Wound on 1.0" (25mm) core, Maximum Outside Diameter 4.0" (101mm), 960 per Roll, 12 Rolls per Box. Total Labels per box 11520. Price per Box. Direct Thermal Labels for Desktop Printers, Size: 63mm x 50mm - Direct Thermal (DT) Die-Cut Standard Labels for Desktop Printers, Size: 63mm (width) x 50mm (height), White Uncoated Paper, Permanent Adhesive, Outside Wound on 1.0" (25mm) core, Maximum Outside Diameter 5.0" (127mm), 1445 per Roll, 12 Rolls per Box. Total Labels per box 17340. Price per Box. Direct Thermal Labels for Desktop Printers, Size: 63mm x 50mm - Direct Thermal (DT) Die-Cut Standard Labels for Desktop Printers, Size: 63mm (width) x 50mm (height), White Uncoated Paper, Permanent Adhesive, Outside Wound on 1.0" (25mm) core, Maximum Outside Diameter 4.0" (101mm), 735 per Roll, 12 Rolls per Box. Total Labels per box 8820. Price per Box. Direct Thermal Labels for Desktop Printers, Size: 76mm x 26mm - Direct Thermal (DT) Die-Cut Standard Labels for Desktop Printers, Size: 76mm (width) x 26mm (height), White Uncoated Paper, Permanent Adhesive, Outside Wound on 1.0" (25mm) core, Maximum Outside Diameter 5.0" (127mm), 2670 per Roll, 12 Rolls per Box. Total Labels per box 32040. Price per Box. Direct Thermal Labels for Desktop Printers, Size: 76mm x 38mm - Direct Thermal (DT) Die-Cut Standard Labels for Desktop Printers, Size: 76mm (width) x 38mm (height), White Uncoated Paper, Permanent Adhesive, Outside Wound on 1.0" (25mm) core, Maximum Outside Diameter 5.0" (127mm), 1830 per Roll, 12 Rolls per Box. Total Labels per box 21960. Price per Box. Direct Thermal Labels for Desktop Printers, Size: 76mm x 38mm - Direct Thermal (DT) Die-Cut Standard Labels for Desktop Printers, Size: 76mm (width) x 38mm (height), White Uncoated Paper, Permanent Adhesive, Outside Wound on 1.0" (25mm) core, Maximum Outside Diameter 4.0" (101mm), 960 per Roll, 12 Rolls per Box. Total Labels per box 11520. Price per Box. Direct Thermal Labels for Desktop Printers, Size: 76mm x 51mm - Direct Thermal (DT) Die-Cut Standard Labels for Desktop Printers, Size: 76mm (width) x 51mm (height), White Uncoated Paper, Permanent Adhesive, Outside Wound on 1.0" (25mm) core, Maximum Outside Diameter 4.0" (101mm), Perforated, 735 per Roll, 12 Rolls per Box. Total Labels per box 8820. Price per Box. Direct Thermal Labels for Desktop Printers, Size: 102mm x 25mm - Direct Thermal (DT) Die-Cut Standard Labels for Desktop Printers, Size: 102mm (width) x 25mm (height), White Uncoated Paper, Permanent Adhesive, Outside Wound on 1.0" (25mm) core, Maximum Outside Diameter 5.0" (127mm), 2670 per Roll, 12 Rolls per Box. Total Labels per box 32040. Price per Box. Direct Thermal Labels for Desktop Printers, Size: 76mm x 51mm - Direct Thermal (DT) Die-Cut Standard Labels for Desktop Printers, Size: 76mm (width) x 51mm (height), White Uncoated Paper, Permanent Adhesive, Outside Wound on 1.0" (25mm) core, Maximum Outside Diameter 5.0" (127mm), Perforated, 1445 per Roll, 12 Rolls per Box. Total Labels per box 17340. Price per Box. Direct Thermal Labels for Desktop Printers, Size: 102mm x 102mm - Direct Thermal (DT) Die-Cut Standard Labels for Desktop Printers, Size: 102mm (width) x 102mm (height), White Uncoated Paper, Permanent Adhesive, Outside Wound on 1.0" (25mm) core, Maximum Outside Diameter 5.0" (127mm), Perforated, 745 per Roll, 12 Rolls per Box. Total Labels per box 8940. Price per Box. Direct Thermal Labels for Desktop Printers, Size: 102mm x 102mm - Direct Thermal (DT) Die-Cut Standard Labels for Desktop Printers, Size: 102mm (width) x 102mm (height), White Uncoated Paper, Permanent Adhesive, Outside Wound on 1.0" (25mm) core, Maximum Outside Diameter 4.0" (101mm), Perforated, 377 per Roll, 12 Rolls per Box. Total Labels per box 4524. Price per Box. Direct Thermal Labels for Desktop Printers, Size: 102mm x 127mm - Direct Thermal (DT) Die-Cut Standard Labels for Desktop Printers, Size: 102mm (width) x 127mm (height), White Uncoated Paper, Permanent Adhesive, Outside Wound on 1.0" (25mm) core, Maximum Outside Diameter 5.0" (127mm), Perforated, 600 per Roll, 12 Rolls per Box. Total Labels per box 7200. Price per Box. Direct Thermal Labels for Desktop Printers, Size: 102mm x 127mm - Direct Thermal (DT) Die-Cut Standard Labels for Desktop Printers, Size: 102mm (width) x 127mm (height), White Uncoated Paper, Permanent Adhesive, Outside Wound on 1.0" (25mm) core, Maximum Outside Diameter 4.0" (101mm), Perforated, 305 per Roll, 12 Rolls per Box. Total Labels per box 3660. Price per Box. Direct Thermal Labels for Desktop Printers, Size: 102mm x 152mm - Direct Thermal (DT) Die-Cut Standard Labels for Desktop Printers, Size: 102mm (width) x 152mm (height), White Uncoated Paper, Permanent Adhesive, Outside Wound on 1.0" (25mm) core, Maximum Outside Diameter 5.0" (127mm), Perforated, 500 per Roll, 12 Rolls per Box. Total Labels per box 6000. Price per Box. Thermal Transfer Labels for Desktop Printers, Size: 38mm x 25mm - Thermal Transfer (TT) Die-Cut Standard Labels for Desktop Printers, Size: 38mm (width) x 25mm (height), White Semi-Gloss Paper, Permanent Adhesive, Outside Wound on 1.0" (25mm) core, Maximum Outside Diameter 5.0" (127mm), 2670 per Roll, 12 Rolls per Box. Total Labels per box 32040. Price per Box. Thermal Transfer Labels for Desktop Printers, Size: 38mm x 25mm - Thermal Transfer (TT) Die-Cut Standard Labels for Desktop Printers, Size: 38mm (width) x 25mm (height), White Semi-Gloss Paper, Permanent Adhesive, Outside Wound on 1.0" (25mm) core, Maximum Outside Diameter 4.0" (101.6mm), 1380 per Roll, 12 Rolls per Box. Total Labels per box 16560. Price per Box. Thermal Transfer Labels for Desktop Printers, Size: 40mm x 40mm - Thermal Transfer (TT) Die-Cut Standard Labels for Desktop Printers, Size: 40mm (width) x 40mm (height), White Semi-Gloss Paper, Permanent Adhesive, Outside Wound on 1.0" (25mm) core, Maximum Outside Diameter 4.0" (101.6mm), 900 per Roll, 12 Rolls per Box. Total Labels per box 10800. Price per Box. Thermal Transfer Labels for Desktop Printers, Size: 57mm x 32mm - Thermal Transfer (TT) Die-Cut Standard Labels for Desktop Printers, Size: 57mm (width) x 32mm (height), White Semi-Gloss Paper, Permanent Adhesive, Outside Wound on 1.0" (25mm) core, Maximum Outside Diameter 5.0" (127mm), 2235 per Roll, 12 Rolls per Box. Total Labels per box 26820. Price per Box. Direct Thermal Labels for Desktop Printers, Size: 102mm x 152mm - Direct Thermal (DT) Die-Cut Standard Labels for Desktop Printers, Size: 102mm (width) x 152mm (height), White Uncoated Paper, Permanent Adhesive, Outside Wound on 1.0" (25mm) core, Maximum Outside Diameter 4.0" (101mm), Perforated, 250 per Roll, 12 Rolls per Box. Total Labels per box 3000. Price per Box. Direct Thermal Labels for Desktop Printers, Size: 102mm x 38mm - Direct Thermal (DT) Die-Cut Standard Labels for Desktop Printers, Size: 102mm (width) x 38mm (height), White Uncoated Paper, Permanent Adhesive, Outside Wound on 1.0" (25mm) core, Maximum Outside Diameter 5.0" (127mm), Perforated, 1800 per Roll, 12 Rolls per Box. Total Labels per box 21600. Price per Box. Direct Thermal Labels for Desktop Printers, Size: 102mm x 38mm - Direct Thermal (DT) Die-Cut Standard Labels for Desktop Printers, Size: 102mm (width) x 38mm (height), White Uncoated Paper, Permanent Adhesive, Outside Wound on 1.0" (25mm) core, Maximum Outside Diameter 4.0" (101mm), Perforated, 960 per Roll, 12 Rolls per Box. Total Labels per box 11520. Price per Box. Direct Thermal Labels for Desktop Printers, Size: 102mm x 64mm - Direct Thermal (DT) Die-Cut Standard Labels for Desktop Printers, Size: 102mm (width) x 64mm (height), White Uncoated Paper, Permanent Adhesive, Outside Wound on 1.0" (25mm) core, Maximum Outside Diameter 4.0" (101mm), Perforated, 640 per Roll, 12 Rolls per Box. Total Labels per box 7680. Price per Box. Direct Thermal Labels for Desktop Printers, Size: 102mm x 76mm - Direct Thermal (DT) Die-Cut Standard Labels for Desktop Printers, Size: 102mm (width) x 76mm (height), White Uncoated Paper, Permanent Adhesive, Outside Wound on 1.0" (25mm) core, Maximum Outside Diameter 5.0" (127mm), Perforated, 985 per Roll, 12 Rolls per Box. Total Labels per box 11820. Price per Box. Direct Thermal Labels for Desktop Printers, Size: 102mm x 76mm - Direct Thermal (DT) Die-Cut Standard Labels for Desktop Printers, Size: 102mm (width) x 76mm (height), White Uncoated Paper, Permanent Adhesive, Outside Wound on 1.0" (25mm) core, Maximum Outside Diameter 4.0" (101mm), Perforated, 500 per Roll, 12 Rolls per Box. Total Labels per box 6000. Price per Box. Thermal Transfer Labels for Desktop Printers, Size: 57mm x 32mm - Thermal Transfer (TT) Die-Cut Standard Labels for Desktop Printers, Size: 57mm (width) x 32mm (height), White Semi-Gloss Paper, Permanent Adhesive, Outside Wound on 1.0" (25mm) core, Maximum Outside Diameter 4.0" (101.6mm), 1135 per Roll, 12 Rolls per Box. Total Labels per box 13620. Price per Box. Thermal Transfer Labels for Desktop Printers, Size: 60mm x 38mm - Thermal Transfer (TT) Die-Cut Standard Labels for Desktop Printers, Size: 60mm (width) x 38mm (height), White Semi-Gloss Paper, Permanent Adhesive, Outside Wound on 1.0" (25mm) core, Maximum Outside Diameter 4.0" (101.6mm), 960 per Roll, 12 Rolls per Box. Total Labels per box 11520. Price per Box. Thermal Transfer Labels for Desktop Printers, Size: 60mm x 38mm - Thermal Transfer (TT) Die-Cut Standard Labels for Desktop Printers, Size: 60mm (width) x 38mm (height), White Semi-Gloss Paper, Permanent Adhesive, Outside Wound on 1.0" (25mm) core, Maximum Outside Diameter 5.0" (127mm), 1830 per Roll, 12 Rolls per Box. Total Labels per box 21960. Price per Box. Thermal Transfer Labels for Desktop Printers, Size: 63mm x 50mm - Thermal Transfer (TT) Die-Cut Standard Labels for Desktop Printers, Size: 63mm (width) x 50mm (height), White Semi-Gloss Paper, Permanent Adhesive, Outside Wound on 1.0" (25mm) core, Maximum Outside Diameter 4.0" (101.6mm), 735 per Roll, 12 Rolls per Box. Total Labels per box 8820. Price per Box. Thermal Transfer Labels for Desktop Printers, Size: 50mm x 25mm - Thermal Transfer (TT) Die-Cut Standard Labels for Desktop Printers, Size: 50mm (width) x 25mm (height), White Semi-Gloss Paper, Permanent Adhesive, Outside Wound on 1.0" (25mm) core, Maximum Outside Diameter 4.0" (101.6mm), Perforated, 1380 per Roll, 12 Rolls per Box. Total Labels per box 16560. Price per Box. Thermal Transfer Labels for Desktop Printers, Size: 50mm x 25mm - Thermal Transfer (TT) Die-Cut Standard Labels for Desktop Printers, Size: 50mm (width) x 25mm (height), White Semi-Gloss Paper, Permanent Adhesive, Outside Wound on 1.0" (25mm) core, Maximum Outside Diameter 5.0" (127mm), Perforated, 2670 per Roll, 12 Rolls per Box. Total Labels per box 32040. Price per Box. Thermal Transfer Labels for Desktop Printers, Size: 63mm x 50mm - Thermal Transfer (TT) Die-Cut Standard Labels for Desktop Printers, Size: 63mm (width) x 50mm (height), White Semi-Gloss Paper, Permanent Adhesive, Outside Wound on 1.0" (25mm) core, Maximum Outside Diameter 5.0" (127mm), 1445 per Roll, 12 Rolls per Box. Total Labels per box 17340. Price per Box. Thermal Transfer Labels for Desktop Printers, Size: 76mm x 26mm - Thermal Transfer (TT) Die-Cut Standard Labels for Desktop Printers, Size: 76mm (width) x 26mm (height), White Semi-Gloss Paper, Permanent Adhesive, Outside Wound on 1.0" (25mm) core, Maximum Outside Diameter 5.0" (127mm), 2670 per Roll, 12 Rolls per Box. Total Labels per box 32040. Price per Box. Thermal Transfer Labels for Desktop Printers, Size: 76mm x 38mm - Thermal Transfer (TT) Die-Cut Standard Labels for Desktop Printers, Size: 76mm (width) x 38mm (height), White Semi-Gloss Paper, Permanent Adhesive, Outside Wound on 1.0" (25mm) core, Maximum Outside Diameter 4.0" (101.6mm), 960 per Roll, 12 Rolls per Box. Total Labels per box 11520. Price per Box. Thermal Transfer Labels for Desktop Printers, Size: 76mm x 38mm - Thermal Transfer (TT) Die-Cut Standard Labels for Desktop Printers, Size: 76mm (width) x 38mm (height), White Semi-Gloss Paper, Permanent Adhesive, Outside Wound on 1.0" (25mm) core, Maximum Outside Diameter 5.0" (127mm), 1830 per Roll, 12 Rolls per Box. Total Labels per box 21960. Price per Box. Thermal Transfer Labels for Desktop Printers, Size: 76mm x 51mm - Thermal Transfer (TT) Die-Cut Standard Labels for Desktop Printers, Size: 76mm (width) x 51mm (height), White Semi-Gloss Paper, Permanent Adhesive, Outside Wound on 1.0" (25mm) core, Maximum Outside Diameter 5.0" (127mm), Perforated, 1445 per Roll, 12 Rolls per Box. Total Labels per box 17340. Price per Box. Thermal Transfer Labels for Desktop Printers, Size: 102mm x 25mm - Thermal Transfer (TT) Die-Cut Standard Labels for Desktop Printers, Size: 102mm (width) x 25mm (height), White Semi-Gloss Paper, Permanent Adhesive, Outside Wound on 1.0" (25mm) core, Maximum Outside Diameter 5.0" (127mm), 2670 per Roll, 12 Rolls per Box. Total Labels per box 32040. Price per Box. Thermal Transfer Labels for Desktop Printers, Size: 101mm x 52mm - Thermal Transfer (TT) Die-Cut Standard Labels for Desktop Printers, Size: 101mm (width) x 52mm (height), White Semi-Gloss Paper, Permanent Adhesive, Outside Wound on 1.0" (25mm) core, Maximum Outside Diameter 4.0" (101.6mm), Perforated, 720 per Roll, 12 Rolls per Box. Total Labels per box 8640. Price per Box. Thermal Transfer Labels for Desktop Printers, Size: 101mm x 52mm - Thermal Transfer (TT) Die-Cut Standard Labels for Desktop Printers, Size: 101mm (width) x 52mm (height), White Semi-Gloss Paper, Permanent Adhesive, Outside Wound on 1.0" (25mm) core, Maximum Outside Diameter 5.0" (127mm), Perforated, 1400 per Roll, 12 Rolls per Box. Total Labels per box 16800. Price per Box. Thermal Transfer Labels for Desktop Printers, Size: 102mm x 102mm - Thermal Transfer (TT) Die-Cut Standard Labels for Desktop Printers, Size: 102mm (width) x 102mm (height), White Semi-Gloss Paper, Permanent Adhesive, Outside Wound on 1.0" (25mm) core, Maximum Outside Diameter 4.0" (101.6mm), Perforated, 377 per Roll, 12 Rolls per Box. Total Labels per box 4524. Price per Box. Thermal Transfer Labels for Desktop Printers, Size: 102mm x 102mm - Thermal Transfer (TT) Die-Cut Standard Labels for Desktop Printers, Size: 102mm (width) x 102mm (height), White Semi-Gloss Paper, Permanent Adhesive, Outside Wound on 1.0" (25mm) core, Maximum Outside Diameter 5.0" (127mm), Perforated, 745 per Roll, 12 Rolls per Box. Total Labels per box 8940. Price per Box. Thermal Transfer Labels for Desktop Printers, Size: 102mm x 127mm - Thermal Transfer (TT) Die-Cut Standard Labels for Desktop Printers, Size: 102mm (width) x 127mm (height), White Semi-Gloss Paper, Permanent Adhesive, Outside Wound on 1.0" (25mm) core, Maximum Outside Diameter 4.0" (101.6mm), Perforated, 305 per Roll, 12 Rolls per Box. Total Labels per box 3660. Price per Box. Thermal Transfer Labels for Desktop Printers, Size: 102mm x 127mm - Thermal Transfer (TT) Die-Cut Standard Labels for Desktop Printers, Size: 102mm (width) x 127mm (height), White Semi-Gloss Paper, Permanent Adhesive, Outside Wound on 1.0" (25mm) core, Maximum Outside Diameter 5.0" (127mm), Perforated, 600 per Roll, 12 Rolls per Box. Total Labels per box 7200. Price per Box. Thermal Transfer Labels for Desktop Printers, Size: 102mm x 152mm - Thermal Transfer (TT) Die-Cut Standard Labels for Desktop Printers, Size: 102mm (width) x 152mm (height), White Semi-Gloss Paper, Permanent Adhesive, Outside Wound on 1.0" (25mm) core, Maximum Outside Diameter 4.0" (101.6mm), Perforated, 250 per Roll, 12 Rolls per Box. Total Labels per box 3000. Price per Box. Thermal Transfer Labels for Desktop Printers, Size: 102mm x 152mm - Thermal Transfer (TT) Die-Cut Standard Labels for Desktop Printers, Size: 102mm (width) x 152mm (height), White Semi-Gloss Paper, Permanent Adhesive, Outside Wound on 1.0" (25mm) core, Maximum Outside Diameter 5.0" (127mm), Perforated, 500 per Roll, 12 Rolls per Box. Total Labels per box 6000. Price per Box. Thermal Transfer Labels for Desktop Printers, Size: 102mm x 38mm - Thermal Transfer (TT) Die-Cut Standard Labels for Desktop Printers, Size: 102mm (width) x 38mm (height), White Semi-Gloss Paper, Permanent Adhesive, Outside Wound on 1.0" (25mm) core, Maximum Outside Diameter 4.0" (101.6mm), Perforated, 960 per Roll, 12 Rolls per Box. Total Labels per box 11520. Price per Box. Thermal Transfer Labels for Desktop Printers, Size: 102mm x 38mm - Thermal Transfer (TT) Die-Cut Standard Labels for Desktop Printers, Size: 102mm (width) x 38mm (height), White Semi-Gloss Paper, Permanent Adhesive, Outside Wound on 1.0" (25mm) core, Maximum Outside Diameter 5.0" (127mm), Perforated, 1800 per Roll, 12 Rolls per Box. Total Labels per box 21600. Price per Box. Thermal Transfer Labels for Desktop Printers, Size: 102mm x 64mm - Thermal Transfer (TT) Die-Cut Standard Labels for Desktop Printers, Size: 102mm (width) x 64mm (height), White Semi-Gloss Paper, Permanent Adhesive, Outside Wound on 1.0" (25mm) core, Maximum Outside Diameter 4.0" (101.6mm), Perforated, 640 per Roll, 12 Rolls per Box. Total Labels per box 7680. Price per Box. Thermal Transfer Labels for Desktop Printers, Size: 102mm x 76mm - Thermal Transfer (TT) Die-Cut Standard Labels for Desktop Printers, Size: 102mm (width) x 76mm (height), White Semi-Gloss Paper, Permanent Adhesive, Outside Wound on 1.0" (25mm) core, Maximum Outside Diameter 4.0" (101.6mm), Perforated, 500 per Roll, 12 Rolls per Box. Total Labels per box 6000. Price per Box. Thermal Transfer Labels for Desktop Printers, Size: 102mm x 76mm - Thermal Transfer (TT) Die-Cut Standard Labels for Desktop Printers, Size: 102mm (width) x 76mm (height), White Semi-Gloss Paper, Permanent Adhesive, Outside Wound on 1.0" (25mm) core, Maximum Outside Diameter 5.0" (127mm), Perforated, 985 per Roll, 12 Rolls per Box. Total Labels per box 11820. Price per Box. Thermal Transfer Labels for Desktop Printers, Size: 76mm x 51mm - Thermal Transfer (TT) Die-Cut Standard Labels for Desktop Printers, Size: 76mm (width) x 51mm (height), White Semi-Gloss Paper, Permanent Adhesive, Outside Wound on 1.0" (25mm) core, Maximum Outside Diameter 4.0" (101.6mm), Perforated, 735 per Roll, 12 Rolls per Box. Total Labels per box 8820. Price per Box.